If your synthetic sports surface is affected by snow, the easiest – though not always the most convenient – solution is to accept that nothing can be done and close the pitch until it thaws and becomes safe to use. 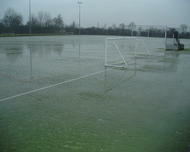 Click here for more advice on looking after your artificial sports surface - whatever the weather! The harsh winter is continuing to take its toll on synthetic sports surfaces across the country. Mistakenly labelled as ‘all-weather’, many facilities have been all but unusable during the recent snowfall, with some still experiencing problems even after the snow had thawed. 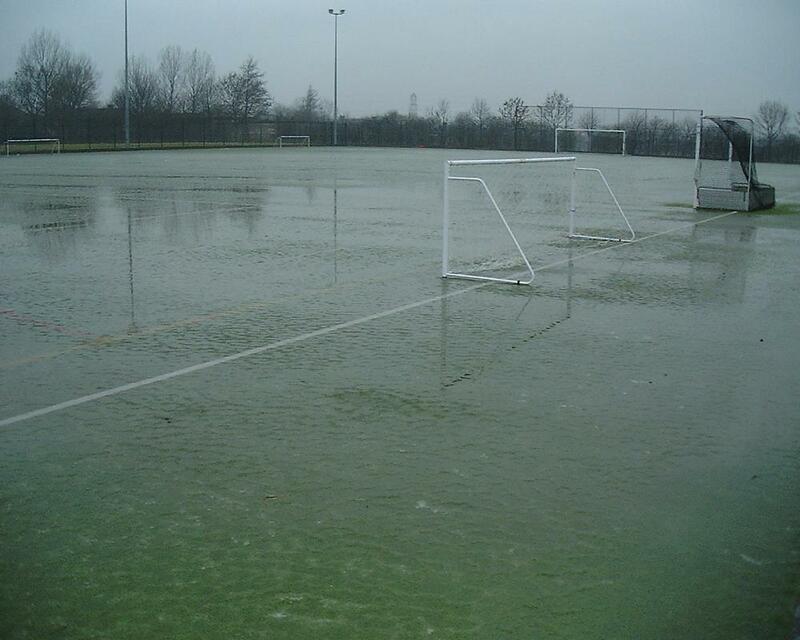 If maintained correctly, a synthetic sports surface should be playable in most weathers. However, the one element that such facilities cannot necessarily withstand is a drop in temperature and the inevitable frost and freezing conditions that ensue. During the winter months a synthetic surface will retain a large moisture content and inevitably this moisture will freeze, causing the surface to become hard and often unsafe to play on. It is not uncommon for the synthetic surface to remain frozen even when surrounding natural grass areas have thawed. This is due to the low core temperature of the surface and the insulating effect that the infill and carpet creates. This can then be compounded with snowfall, which will quickly settle on the surface and stay for a longer period as it sits on the frozen carpet. Again, the snow will often melt quicker on surrounding natural grass and hard-standing areas before it melts on the synthetic surface, due to the insulated low core temperature of the surface. On most synthetic sports surfaces, it is unlikely that much can be done to remove snow from the playing area in the short-term, especially without a suitable area to store large piles of snow. If you do consider clearing snow from your surface, it is vital that this is done when the snow first falls. If allowed to thaw and re freeze it will be almost impossible to remove the ice without damaging the surface, as it will stick to the carpet. Snow clearing should only be completed with the appropriate machinery and tools; snowploughs can be utilised, but the drive unit should be suitable in size for your surface, and the plough blade should also be made of a suitable material. Rubber-flanged blades will help to protect the surface from damage. Alternatively, powered brushes could be used, but you should check that the bristles are manufactured to an appropriate specification so as not to damage the carpet. In both cases, operator experience is crucial so as not to remove any infill as well as the snow at the same time. Attempting to take off large amounts of snow from a synthetic surface can affect infill levels in this way, and if left unremedied, infill displacement can weaken the fibres and increase the rate at which the carpet wears, compromising the playing characteristics and foreshortening the life expectancy of the surface. A specialist maintenance contractor such as Technical Surfaces can carry out granular top-ups to restore infill levels, and Power Sweeping maintenance to help correct any uneven distribution. In recent weeks, dirt, leaf debris and other detritus is also likely to have become trapped on some surfaces beneath the quick-falling snow, unable to be removed and so left to decompose into the carpet. As long as the surface is being adequately maintained throughout the rest of the year this should not pose too severe a problem, but in all cases it is important to remove any trapped debris by Drag Brushing and Power Sweeping the surface as soon as possible. Failing to regularly remove debris from a synthetic pitch or court will cause contamination of the infill, which in turn prevents water from draining freely through the carpet. Once the snow has melted, most surfaces should return to normal, their drainage systems able to withstand the volume of water. However, if a surface cannot adequately drain, or is left with silt and mud deposits, it is a clear sign of problems with infill contamination, which only a deep-cleaning procedure can remedy, such as Technical Surfaces’ patented Rejeneration®. Interim measures, for example a Winter Revival™, can help to aesthetically improve your surface in the short-term, but will not solve the root cause of the problem. Following a thaw, synthetic sports surfaces should be thoroughly inspected, either in-house or by a qualified assessor such as Technical Surfaces, to check for any carpet damage. During periods of extreme cold, the contraction and expansion of the water as it thaws and re-freezes will ‘blow’ the carpet seams in much the same way as bursting pipes. If the carpet has not been adequately bonded together, a synthetic surface exposed to freezing temperatures may also suffer the effects of weak or split seams. Such areas pose a trip hazard and must be repaired at the earliest opportunity. Whilst snow presents its own unique problems with little that can be done, a frozen or frosty surface can often be prevented by applying a specialist PDV (pure dried vacuum) salt to the surface. Such a product has few impurities so is less likely to cause damage or contamination to the surface. Other products such as rock salt or grit should be avoided, as once dissolved they could cause contamination and damage to the playing surface. Chemical-based solutions do work, although they can be costly and offer little in the way of residue life. PDV salt should be considered as a preventative anti-freeze application rather than a de-icer, and one application will not necessarily provide a long term remedy. If your synthetic sports surface is affected by snow, the easiest – though not always the most convenient – solution is to accept that nothing can be done and close the pitch until it thaws and becomes safe to use. Thankfully, whilst snow can be debilitating to such facilities in the UK, it currently poses only an infrequent and temporary inconvenience. Whether that remains the case in the long-term is a topic for debate amongst climatologists, and investigations may well need to be made into the option of under-surface heating, at least for top-level facilities which can’t afford to remain unused.